“Irving Berlin’s White Christmas” runs Nov. 27-Dec. 8 at the Fox Theatre. Details, tickets HERE or at 855.285.8499. IT REALLY DOES SNOW onstage in Irving Berlin’s White Christmas. But it’s not a gimmick. In this case, snowfall is obligatory. 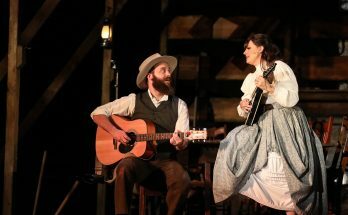 The show’s title promises it, the plot’s resolution depends on it, and Irving Berlin’s words and melodies yearn for it. 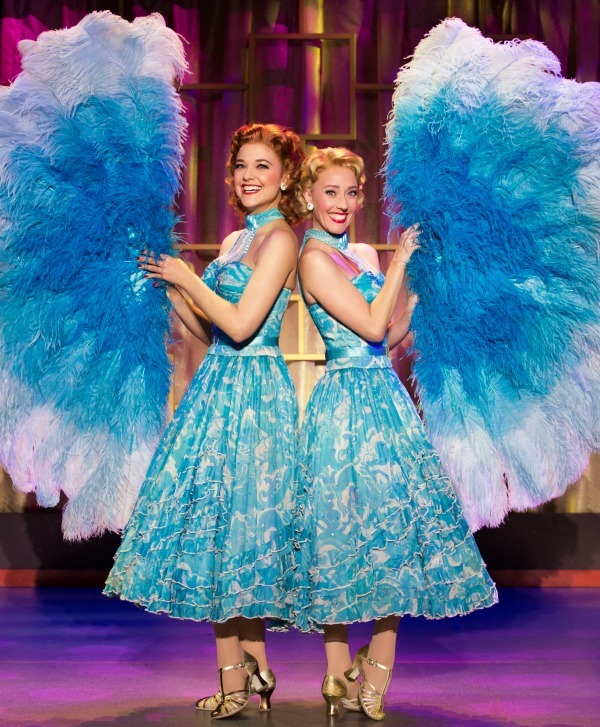 There were never such devoted sisters: Kelly Conte (left) and Kelly Sheehan play Betty and Judy Haynes. All photos by Jeremy Daniel. But making it snow onstage is no easy matter, especially when all the characters regularly complain about the unseasonably “balmy” December weather in Vermont. And it takes a heap of snow to make a truly white Christmas. After more than 25 years of lighting the Radio City Music Hall Christmas Spectacular — kick lines, flying sleighs, blizzards and more — Billington knows all the behind-the-scenes tricks. Still, he’s never impervious to the simple magic of snowfall or the earnest truth in a classic tune. Every time he watches the ending, he says, he chokes up. 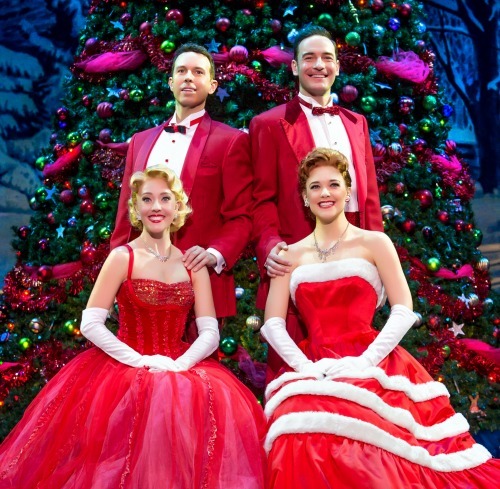 The White Christmas creative team is led by Tony Award-winning director Walter Bobbie, who cut his teeth on musical revivals and reconstructions as artistic director of City Center’s Encores! series. That’s where his stripped-down rival of Chicago began and, under Billington’s lights, has been on Broadway since 1996. Book writers David Ives and Paul Blake are devotees of adaptation as an art form. Scenic designer Anna Louizos’ calling card is Avenue Q. Costume designer Carrie Robbins, who has 30 Broadway shows to her credit, completes the team. When the barn doors open and audiences see snow for the first time, the gang has just saved the general’s old inn from bankruptcy, lovers have reconciled and the big musical revue that was rehearsing in the barn is SRO (a real MGM let’s-put-on-a-show spectacular with an A-list budget and a soundstage full of scenery). Jeremy Benton (clockwise, from top left), Sean Montgomery, Kerry Conte and Kelly Sheehan as Phil Davis, Bob Wallace, Betty Haynes and Judy Haynes (or, for fans of the movie) Bing Crosby, Danny Kaye, Rosemary Clooney and Vera-Ellen. 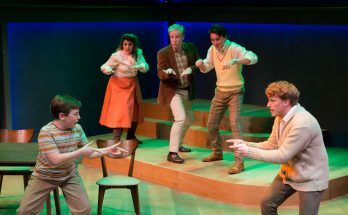 For the show’s first snowfall, the White Christmas team decided that pure stagecraft served the scene best. Simple, effective and artful — nothing slick or high tech. The team chose what is, perhaps, the most old-fashioned way to make snow. When the first dancer to play Simon Legree chased Little Eva through the blizzard in The King and I a hundred years ago, the storm was probably created by a snow bag. White Christmas uses the same technology. The snow comes from a company called Artistry in Motion in Van Nuys, Calif. It’s a confetti mixture of tissue paper cut into a half-and-half mixture of half-inch and three-quarters-inch squares, which gives a more natural look to the snowfall. The paper petals are packed into the snow bag — a long tube of fabric, cut with slits and positioned upstage of the barn doors — just out of view of the audience. Offstage, two ropes hang from one end of the snow bag, which is longer than the barn door is wide, so the snow will fall evenly across the huge opening. Stagehands positioned at either end of the stage tug the ropes back and forth to shake the snow squares out of the holes in the bag. It’s tiring work — switch and repeat, again and again, until it’s time for the snow to stop. It snows for about five minutes at each performance, and although the snow is recycled as much as it can be, White Christmas requires about 10 pounds of confetti per week. 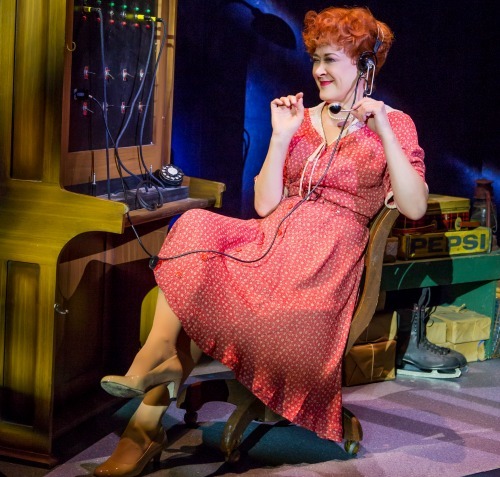 Tony Award winner and Broadway regular Karen Ziemba (“Contact”) is Martha Watson. Upstage a bit, Louizos designed a country landscape lit by moonlight. When the drop is illuminated from behind, it glows. It’s a classic scenic technique that predates 1950s showbiz chic, combined with the kind of “Hollywood does Broadway” production number usually seen only in movies. When the full cast sings “White Christmas” and the audience joins in, well, that’s a Christmas classic. And the perfect setup for an upbeat curtain call. 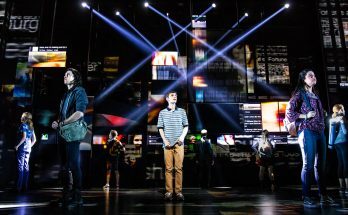 After the company bows and the curtain falls, the leads head downstage and launch into a reprise of “I’ve Got My Love to Keep Me Warm.” The curtain goes up on a whole new set. It’s snowing again, and the company reunites amid a stage full of flurries, poised for another avalanche of song and dance. As they start to sing, it begins to snow. Everywhere. Billington wants to preserve some of the secrets of this final effect, but admits using a high-tech Snowmaster 3000, a foam-snow machine developed for theme-park attractions and nightclub parties. It creates a perfect state of mind with which to accept and embrace the season … for at least a month or so. This piece originally appeared in the San Francisco Chronicle.